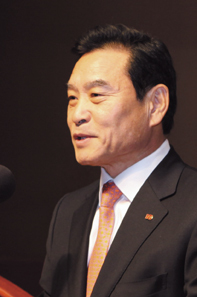 Korea South-East Power Co. (KOSEP) President and CEO Jang Do-soo has urged his executives and staff members to concentrate on having world-class management standards in place and expand overseas projects to secure new growth momentum. KOSEP ranked top in a management evaluation of power companies for the first time since its establishment and won the presidential award and the Order of Industrial Service, Gold Tower during the 36th National Quality Management Convention. KOSEP also received the grand prize in the public enterprise category of the 2010 Korea International Value Engineering Award for the second straight year. In the overseas business sector, he said chances are high that KOSEP could land a project to build diesel-fueled power plants in Ecuador and photovoltaic power plant projects in Bulgaria, becoming Korea’s first EPC project involving Korean power companies. The power company set a foothold for its entry into the new and renewable energy sectors in Europe and South America by successfully carrying out wind power projects in Macedonia and Ecuador. Additionally, it posted about 300 billion won in operating income, 860 billion won in earnings before interest, taxes, depreciation and amortization (EBITDA) and an expected ratio of 10 percent for operating gain to revenue, he said. Externally, despite forecasts of global economic recovery, there are still lurking uncertainties, including worries about possible financial crises in Europe as well as financial burdens caused by international bituminous coal price increases and interest rate hikes, he said. Explaining the management goals KOSEP will aim for during this year, Jang first called for an acceleration of management innovation. The power company will devote itself to innovating price units through the implementation of the nationwide “small president” (intrapreneur) of each business site, strengthening field-oriented innovation activities based on total productive manufacturing (TPM), and innovating enterprise resources planning (ERP)-based processes. Second, he said, KOSEP will establish world-class management standards. The company will put its heart and soul into establishing system management so that it can concentrate its resources on creating high values by making the most of the ERP regime. Third, he said, KOSEP will be in high gear for implementing overseas businesses for securing new growth momentum. The company will not only focus on the construction and technology commercialization related to its own proprietary power facilities, but also aggressively make inroads into new and renewable energy projects so as to create new revenues and upgrade its brand value. He called for his staff to successfully carry out the diesel-fired power project in Ecuador and the photovoltaic power EPC project in Bulgaria. KOSEP will do its best to yield fruit in overseas businesses by making the most of each region’s centers for exporting wind powers plants ― Macedonia in the European area, Ecuador in South America and Kazakhstan in Central Asia. KOSEP will systematize experts’ programs so as to nurture experts in overseas businesses in such fields as international contracts while devoting itself to developing collaboration projects with firms in Korea and abroad by building business networks, he said. Fourth, he said, KOSEP will fortify its foundation for co-existence between labor and management. Fifth, he said, KOSEP will strive to make the projected Yeongheung Power Units 5 & 6 high-efficiency and environmentally-friendly ones by thoroughly analyzing the construction of the initial versions and minimizing trial and error.